The whole image can ruin mismatched socks. They should correspond to season, outfit and shoes. To choose the right socks should be able not only men but also women. There are some rules matching socks, observing that man will never get in an awkward situation. To remember them easily. There are colors that fit only certain clothes and not wearing the other. First rule: white socks are only for sports. They can go to the gym, put on a jog in the Park, go out to play football. In any case, the white socks not to be worn under a sharp black suit or together with jeans. You need all the light socks to put alongside sports clothes to avoid any temptation to wear them with something inappropriate. Second rule: socks color matched to the color of the pants, not the Shoe. If the pants blue, and the socks should be blue, this rule applies to black and brown pants. If the color of the pants definitely can not be determined, then the socks you want to pick a color more or less suitable. The wrong choice of socks can ruin not only the entire ensemble, but the impression of the man. Socks do not bend or twist. It was in the 80-ies. Now the form of twisted socks will laugh at everyone who will notice it, and create a kind of careless person who much hurry when I dressed. Cranking socks in the ankle - not the best idea. When a man sets down, this nuance at once all will be visible. View hairy legs is not appropriate in the office at work during a meeting or business conversation. Socks should be high, that the feet are not turned out naked, when the man put one leg over the other. 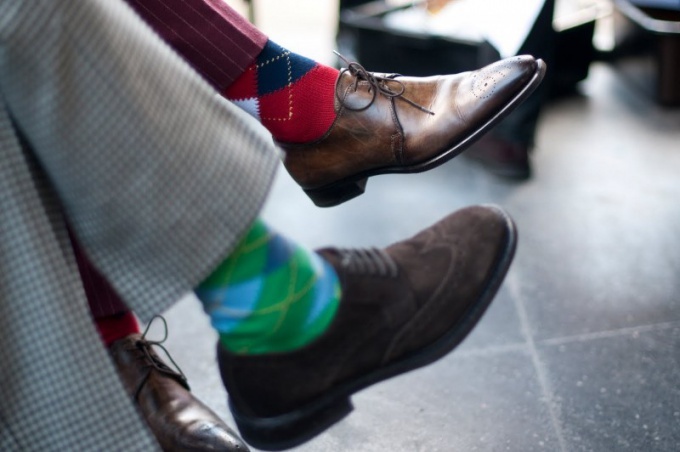 If no socks the right color, they are darker in tone or lighter trousers. Fun colors, designs, embroideries, stripes, appliques on the toes look bright, lively and perky. To wear these socks only in the house in the circle of his family. To go in like that on the street undesirable. To treat the person seriously, when the socks drawn cartoon character, many will be difficult. Wearing socks with shorts. But they should be short and barely noticeable under sneakers. High socks and shorts will visually shorten your legs. Wearing socks with sandals and Slippers are not. It is an indicator of bad taste. Elastic band at socks should not compress the leg, then was formed on the skin intricate patterns. Better to give preference to socks of high quality cotton with a small amount of lycra for better wearability including. Socks made of silk, it is permissible to wear a coat.